Dimensions 0.25 by 5.50 by 8 in. Amazon.com description: Product Description: In his introduction to New Essays on Poe's Major Tales Kenneth Silverman sets forth Poe's theory of the tale, and examines recurrent motifs in his fiction. The essays that follow present a variety of critical approaches and illuminate different facets of Poe's complex imagination, concentrating on such famous tales as The Cask of Amontillado, The Fall of the House of Usher, The Black Cat, and The Murders in the Rue Morgue. In interpreting one or a few of Poe's classic tales, the critics also illuminate such broader issues as his depiction of women, his theory of knowledge, his understanding of perversity, his relation to popular culture, and his preoccupation with death. 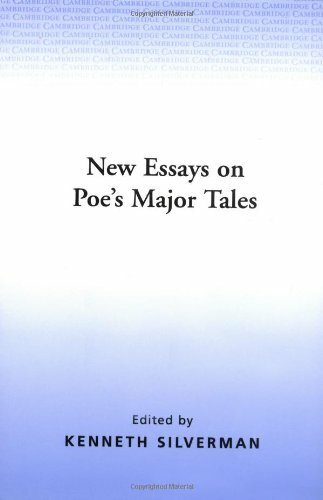 About: In his introduction to New Essays on Poe's Major Tales Kenneth Silverman sets forth Poe's theory of the tale, and examines recurrent motifs in his fiction.